Geckos stick amazingly well to surfaces that should be extremely hard to stick to. There are no handholds or opportunity for velcro-style attachment on clean glass, but they have no trouble with that – indeed, perversely, they have more trouble sticking to dirty glass than clean glass. Their toes are not suction cups, nor are they sticky in the sense of stickers or glue. Their toes are dry and leave no sticky residue behind where they walk. 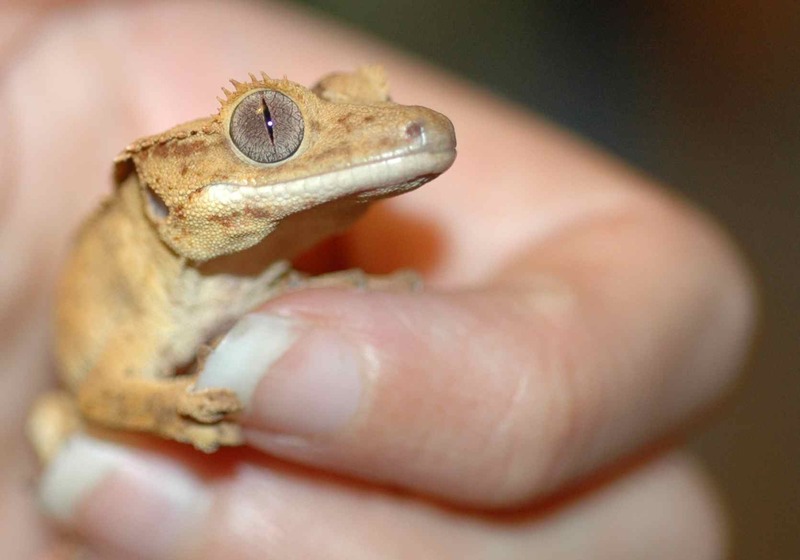 Even stranger, geckos are able to control their stickiness: a gecko walking along your arm lifts his feet with no trouble, but if you try to pick the gecko up, his toes suddenly adhere to your skin. However, there is definitely something going on with those toes. 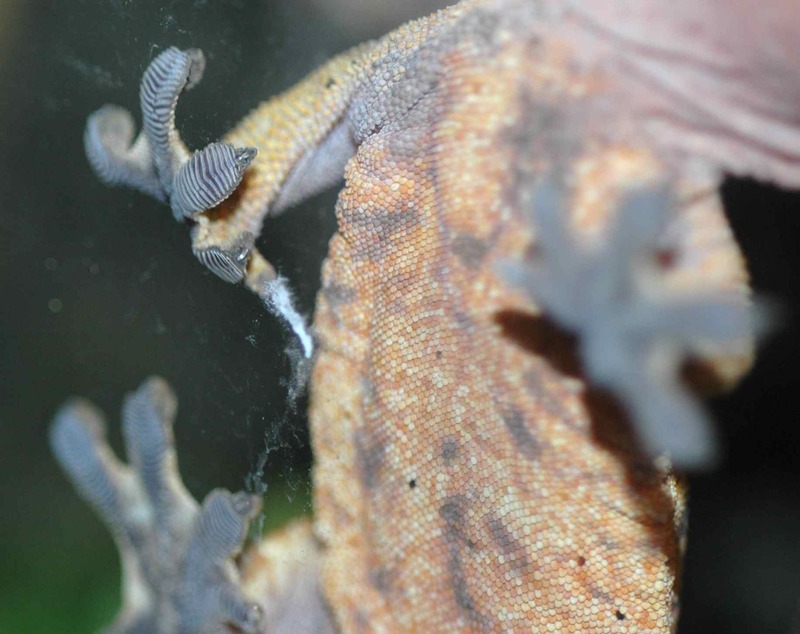 Gecko toes are covered in tiny ridges, which are themselves covered in really tiny hairs, called setae. But how do ridges and setae make you sticky? Ember showing off his toe ridges. 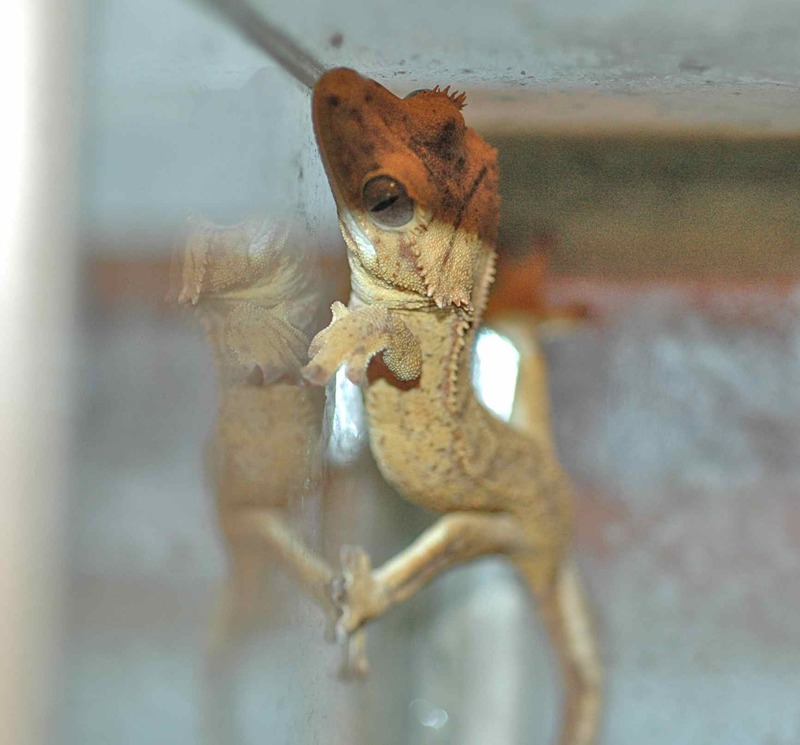 One mechanism proposed for geckos’ stickiness was “thin-film capillary force,” which is based in the power of hydrophilia (literally, “love of water”). Molecules can be hydrophilic – water-loving – or the opposite, hydrophobic. If you’ve ever seen water striders standing on the surface of a pond, you’ve seen hydrophilia in action: water molecules “love” other water molecules (they’re at a lower energy state when near water) and try to stay in contact with them, resisting anything that would separate them; this resistance is strong enough to keep the water striders from penetrating the surface of the water. 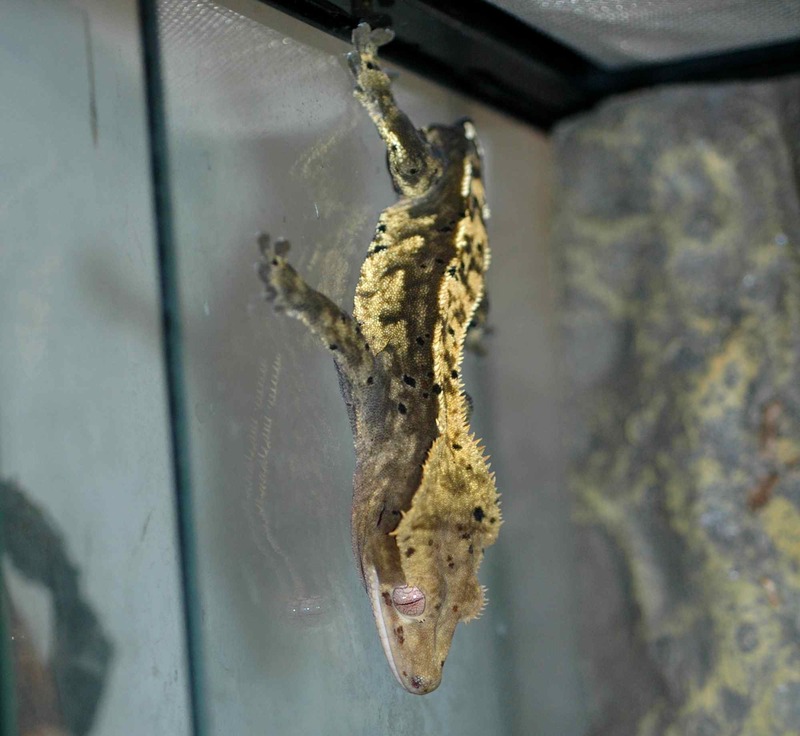 Thin-film capillary sticking would involve a thin film of water on the gecko’s toes. If the toes are hydrophilic and the surface is hydrophilic, the water-love of both surfaces could be enough to stick them together – think of how two pieces of paper, not at all sticky, can be stuck to each other by glue, since each one sticks to the glue. Insects, amphibians, and maybe even some mammals use thin-film capillary forces to stick to smooth surfaces like glass. 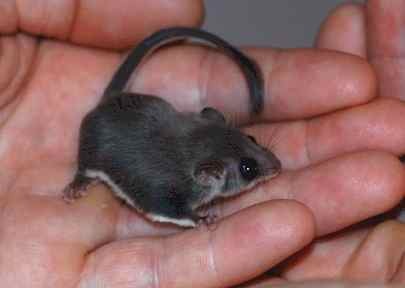 The feathertail glider, a small marsupial, probably uses capillary adhesion to stick to things. Capillary adhesion requires water. The feathertail glider has sweat glands in its feet; geckos don’t. However, they would need so little water – even a one-molecule-thick film might suffice – that it’s possible that geckos could use atmospheric moisture, especially since most “sticky” geckos live in humid habitats. 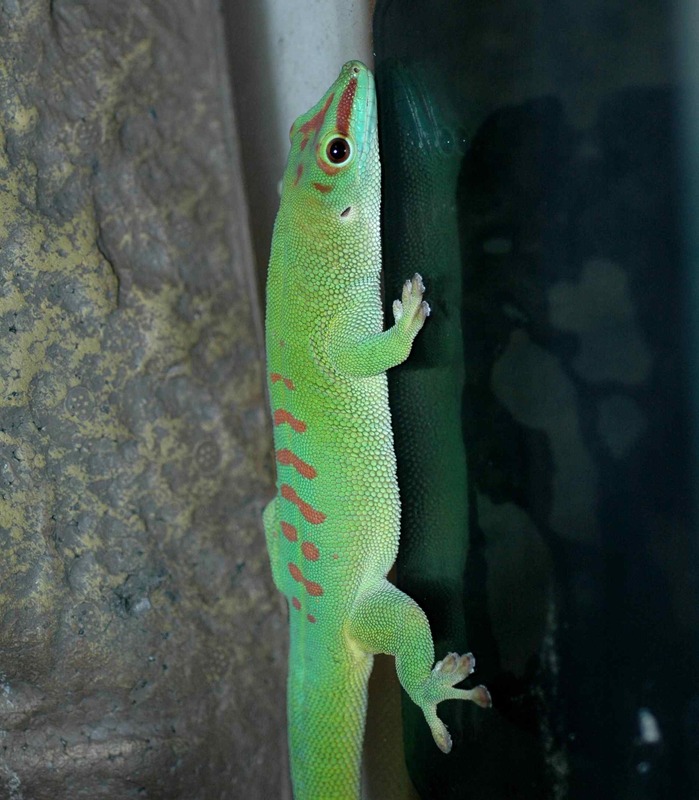 The other possibility is that geckos use van der Waals forces to stick. van der Waals forces arise from the interactions of molecules. Most molecules have some variation in the charge on different parts of the molecule: one bit is a little negative, another a little positive. When they come close to other molecules, even molecules without any charge, the charges of the first molecule may induce charges in the second, as the slightly-positive bit draws electrons a little bit more towards it. The two molecules are then slightly attracted to each other. The interactions that make up van der Waals forces are weak and ephemeral, but multiplied over many molecules, the combined force can be powerful. 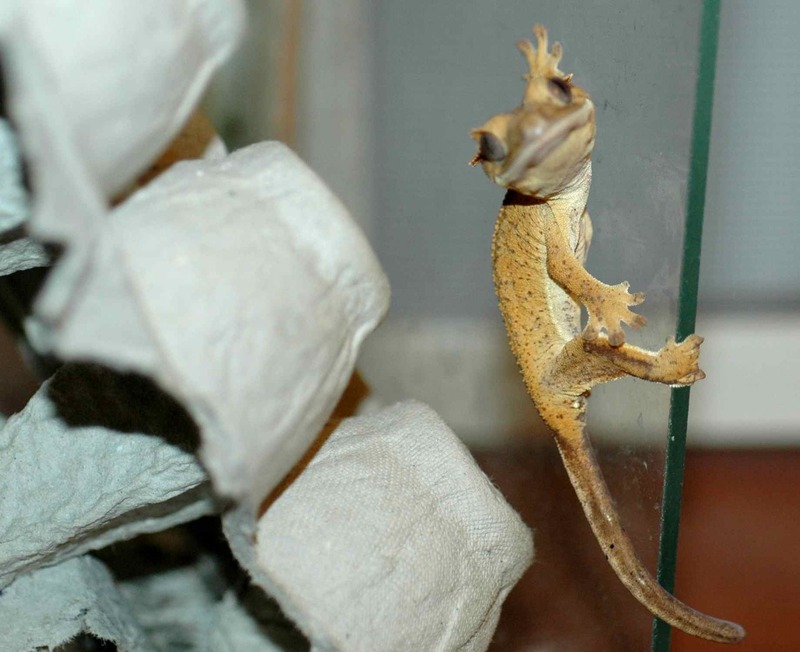 They found that the geckos stuck to both surfaces, regardless of hydrophobicity. van der Waals forces win! Sigma is sticking by the power of tiny intermolecular interactions. He’s basically using the Force. Each gecko seta is tipped with a tiny flat triangle, like a spatula; it’s the huge combined surface area of these many, many spatulas that lets the geckos harness van der Waals forces. The research team that did this even managed to make their own synthetic sticky stuff using the same design. And then they made a gecko robot with it. So why don’t the geckos get stuck – how do you unstick billions of tiny intermolecular attractions? It turns out that in order to stick, the setae have to be at the right angle. If you change their angle enough, they come unstuck. So in order to unstick, geckos curl their toes away from the surface, changing the angle of the setae and detaching easily. Ember curling his toes up away from the surface in order to unstick. And that is why geckos can hang out on walls and you can’t – at least until the researchers get around to making sticky gloves for everyone. Lex can stick and you can’t. Nah nah. Rosenberg H, Rose R. 1999. Volar adhesive pads of the feathertail glider, Acrobates pygmaeus (Marsupialia; Acrobatidae). Canadian Journal of Zoology. 77(2):233-248. Autumn K et al. 2000. Adhesive force of a single gecko foot-hair. Nature 405:681-685. Autumn K et al. 2002. 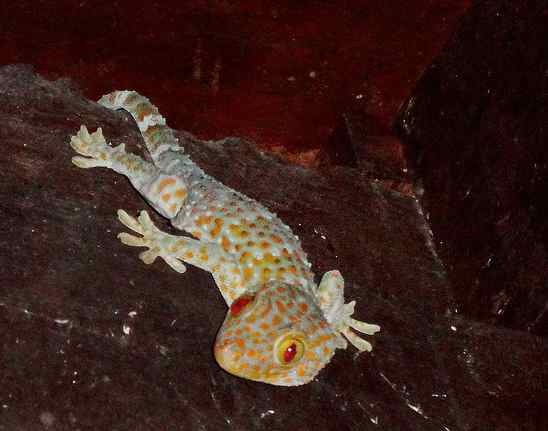 Evidence for van der Waals adhesion in gecko setae. PNAS 99(19):12252-12256. 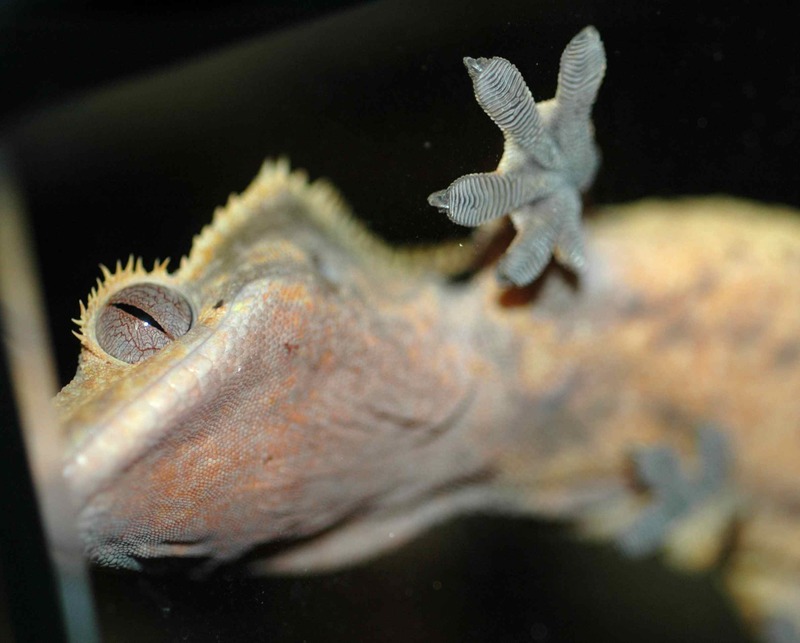 This entry was posted in geckos, general science-y stuff and tagged biology, crested gecko, October, physics, robot, science by toughlittlebirds. Bookmark the permalink. October is the Gecko you hatched from an egg, right–so 3.5 months old? How big is (s)he now? I love the video of the gecko robot!! October is the gecko I hatched, yep – in May, though, so more like 9 months old. I haven’t weighed him (or her) in a while but you can use the egg carton in the first picture or my fingers in the third picture for scale. He’s pretty small. Another great post where I learn wonderful stuff. Love it! Thanks for that. My first encounter with geckos last year had me wondering at their amazing capacity to stick, or not.